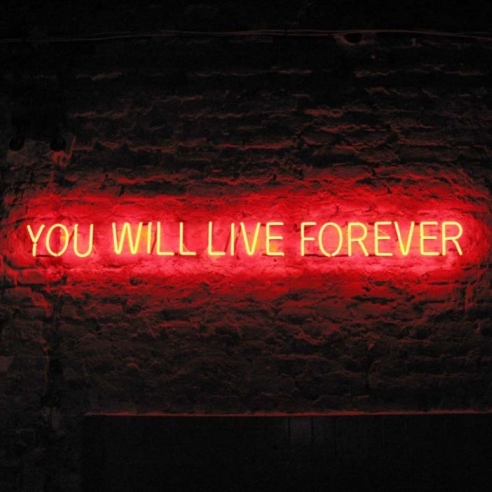 Tim Etchells: Live Forever is a special exhibition featuring the artist’s video Live Forever and the accompanying film stills, printed and mounted on aluminum. Etchells, a keynote speaker at the Tate Modern in November 2013, and the recipient of a Bessie award, often called the Oscars of Dance, in October 2013, is an artist, performer, maker, and writer. He addresses the deconstruction of language and the implication of events unfolding in time through installation, improvised text-performances, interactive audio-experiments, new media, SMS performances, and fiction as well as publicly sited text-works, neon, and LED signage. His simple yet profound video Live Forever comprises a sequence of stills showing letters made from ice, arranged on a concrete floor to spell out the phrase ‘Live Forever’. The ice letters slowly melt, losing definition, into a small stream of water that pools and flows off the screen. The work plays with the tension between the meaning of the text and its ephemeral materiality; the content announcing the bold imperative of an instruction or demand for immortality, whilst the form enacts an entropic descent from the organized solid and legible ice letters to the fluid, unreadable and dispersed as water. Etchells’ work spans many forms and contexts, and he is known for his role as the Artistic Director of Forced Entertainment, the world-renowned performance collective. Between 2008 and 2013, Etchells was the recipient of a Legacy: Thinker in Residence Award through the Live Art Development Agency and Tate Research. From 2004 to 2007 he was a Creative Research Fellow at Lancaster University, and he was awarded an honorary doctorate in 2007 by Dartington College of Arts. His work has been exhibited at: Tate Liverpool; Gasworks, London; Göteburg International Biennale; CASM, Arts Santa Mònica, Barcelona; MACBA, Barcelona; Künstlerhaus Bremen; Netherlands Media Art Institute, Amsterdam; Sparwasser HQ, Berlin; ArtFutures, Bloomberg SPACE, London; The Centre for Book Arts, Canada; Exit Art, New York; and Manifesta 7, Rovereto, Italy.